I do have a pile of things I have dreams of writing about, but my blog queue is not a FILO system. Tonight’s dinner was in front of the RSS Reader, where I was impressed reading Clint Lalonde’s post Of Bikes and Books with his efforts this year to bike ride more, lose weight,and read more books. Of course we are all mere mice compared to Martin Weller’s 48 books read in a year. My ideas for a comment on Clint’s blog started that mushroom cloud unfolding towards a blog post, so I left my congrats and headed over here. I try to make a point of not making new year’s resolutions. My success in 2005 was one I never told anyone, never blogged about it, until I took it on, when I ran a first half marathon in 2006, a few more in the next few years, even completing a full one twice. My blog title summarizes how I feel about running. From a high of 213 pounds in March of this year, with some ongoing data collection I’m down about 20 pounds. I’ve not worn size 34 since 1990. Maybe it’s just a sense of doing something I have not done before (without being very ill) but I really feel better all around, and I am getting much less back and body aches I felt last year while doing physical work outside. Felix is not only a joyful companion and the subject of 600+ photos this year, but we have pegged a lot of walking miles, averaging 5 miles a day. And beyond the weight loss from this, the relaxation of walking, solving (some) problem while walking, meeting new neighbors have all been plusses. I do have a number in mind to get down to, but that’s between me and the scale. More is good. 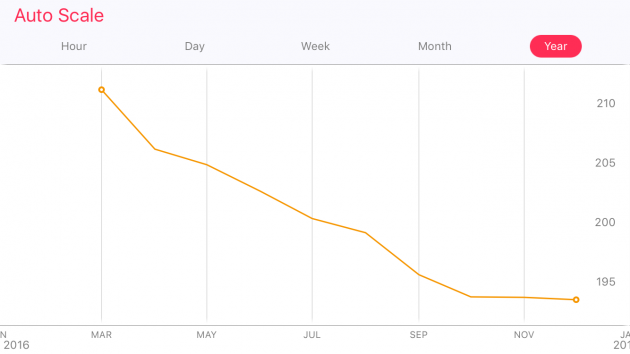 My biking activity, despite getting a new mountain bike last year, has gone to zero. Blame Felix. He is not over over his separation anxiety, so since April I have not left him at home (no major issues, he just cries. And howls, And cries. There are videos. But I will put that out there as a goal. I have enjoyed the last 3 years doing volunteer work with a local group building hiking/biking trails, and they are within biking distance of home. And with not riding, I missed out surviving one loop of the Fire on the Rim annual bike race … but I did build their web site and volunteered on the route (check out my photos). Okay, I have procrastinated enough. I think I read more books this year, but did not do any kind of tracking. I did grab a few of the ones I finished just to take the photo above, and likely I have some photos or blog posts about others. I also have a big pile of partly read books on my Kindle App; I read about 20-30 pages of Cory Doctorow’s Pirate Cinema when I travel, but keep forgetting to finish it off. The goal below might be to finish off those partly read titles. But let’s see what I can check off. 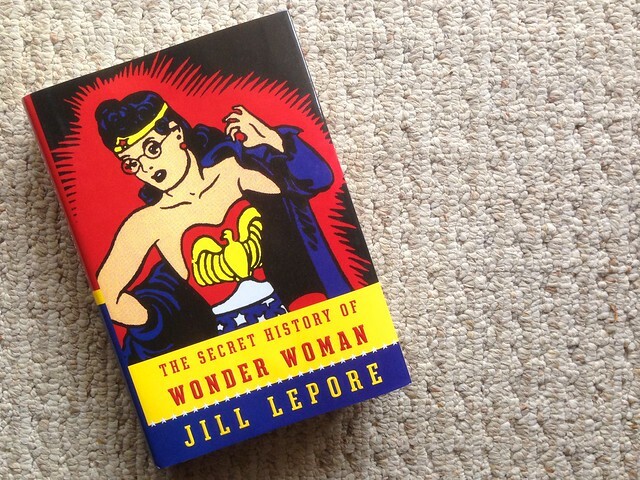 The Secret History of Wonder Woman by Jill Lepore- Tehnically I started last year before heading to VCU for a project in September, where it was their Common Book. Incredibly well written, with footnotes that themselves were stories, I ended up blogging once about wandering into hypertext holes and again how I often found myself going down these holes when they were not even marked as ones. 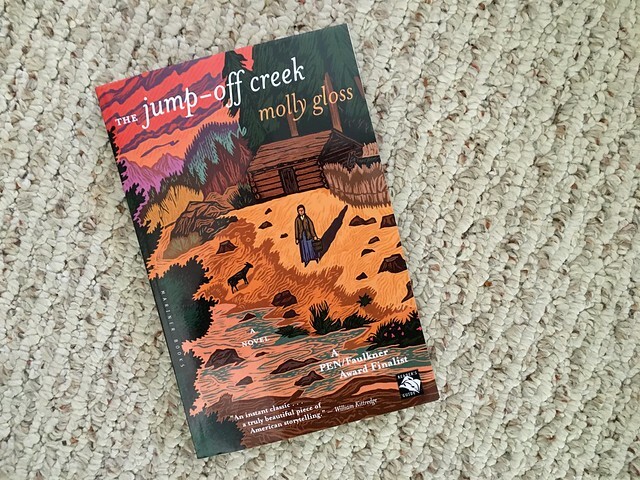 The Jump off Creek by Molly Gloss was sent to me as a gift by Sandy Brown Jensen Brown Jensen during the false run on western ds106. 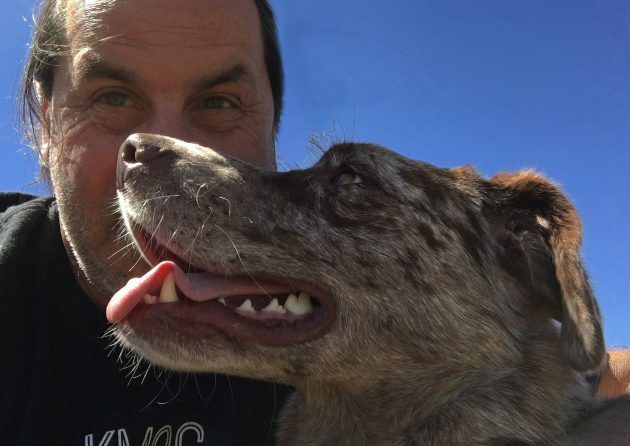 But Sandy had invited Molly to a live ds106 radio broadcast where the author talked about the ideas behind the book and written westerns about a female central character. Location Filming in Arizona: The Screen Legacy of the Grand Canyon State was a book I bought in late March, for reasons I forget. Maybe it was a news story on local PBS. The interest in westerns was still there. It was interesting as a reference for where movies were done in Arizona, it seemed a bit heavier on the films done in southern Arizona; I was hungry for more of the stories behind John Ford’s Monument Valley films, but all of Norther Arizona was a single chapter (Monument Valley got by 4 pages). 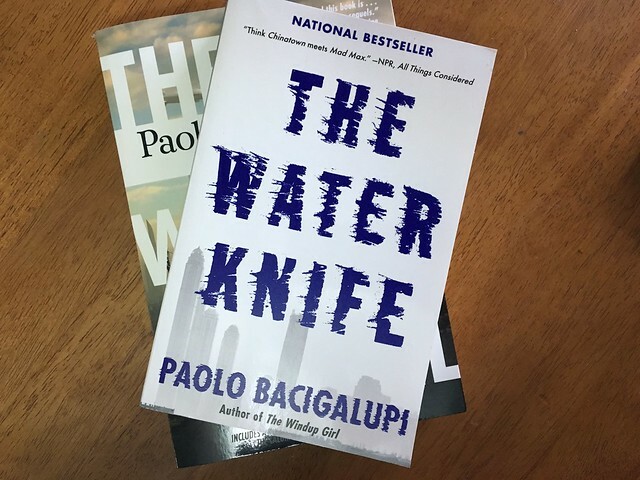 The Water Knife was the first of several books I read that came out of Bryan Alexander’s loosely organized book reading clubs, the first for near-term sci fi with Paolo Bacigalupi’s book on future where the control of water was in the hands of militant states. The book had many draws for me- it was based largely in Phoenix and was really, in my mind, and homage to Marc Reisner’s Cadillac Desert, a book that I drilled into when I first moved to Arizona. Bacigalupi has a tight narrative style, and his plot aimed towards expected outcomes and then did crazy turns. On another front, my friends Oogie and Ken live in the same town as Paulo (Paonia, CO), and know home well. On my visit this summer the timing did not work out to meet him, but I hope to go again. 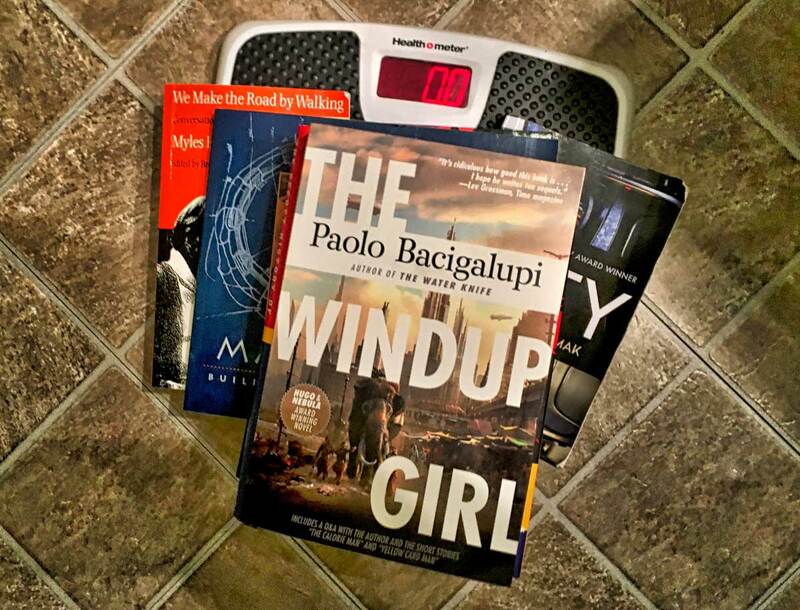 The Windup Girl also by Bacigalupi (I decided to order both at the same time) is an impressive, full future world upside down, as his first novel. It’s not uplifting either, but signals a future controlled by controlled and out of control agriculture. Food here and water in his other novel. 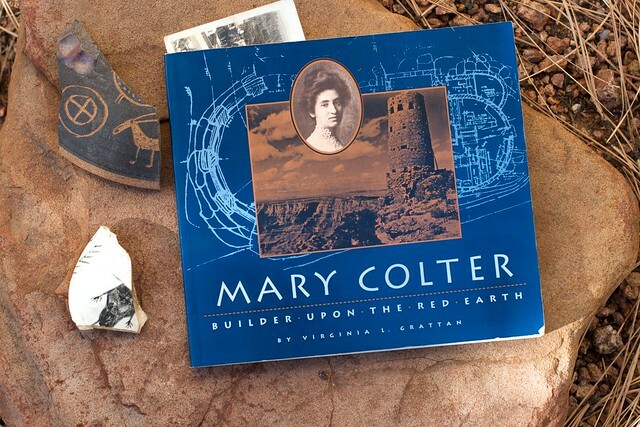 Mary Colter Builder Upon the Red Earth by Virginia L. Grattan is the story of a woman architect who is responsible for many of the classic southwestenr style iconic buildings at the Grand Canyon, and along the Fred Harvey route of the Santa Fe Railroad. I learned of her from my visits to La Posada in Winslow. This book is on my “to blog” list for just the story of how this woman succeeded in the 1920-1050s era of architecture, a field totally dominated by males. But more than that, her sense of design, of fitting in to the land and the traditions has a lot of resonance for people like me who just feel at home in the southwest. Desert of the Heart: A Sojourn in a Community of Solitudes by Karen Chamberlin was a book I just pulled off the shelf in wonder from a little free library in Durango, CO. It’s her story of leaving modern world to live a solitude life in the remote Horsethief Ranch in southern Utah. It hits a lot of my familiar chords of dancing with the joy of aloneness and the emptiness of loneliness. The topic and the physical terrain are familiar ones. 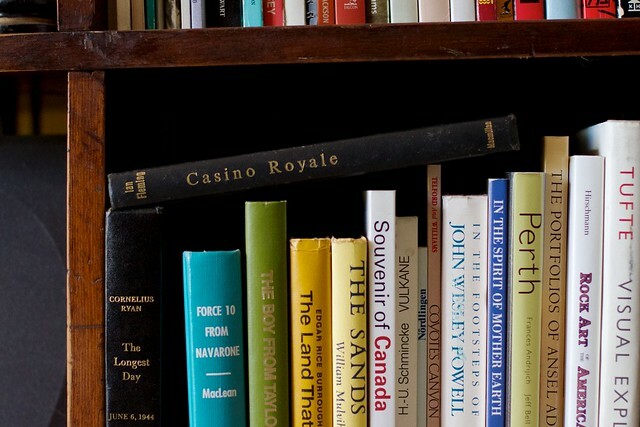 Casino Royale by Ian Fleming was a thin book I bought for a shelf to have a row of old books. I pulled it off to read this year, and was amazed at how much he packed into a thin novel, the first Bond one, the origin of “shaken not stirred”. The book Bond is much more troubled and even flawed then the cold movie one. This one has a blog post too. 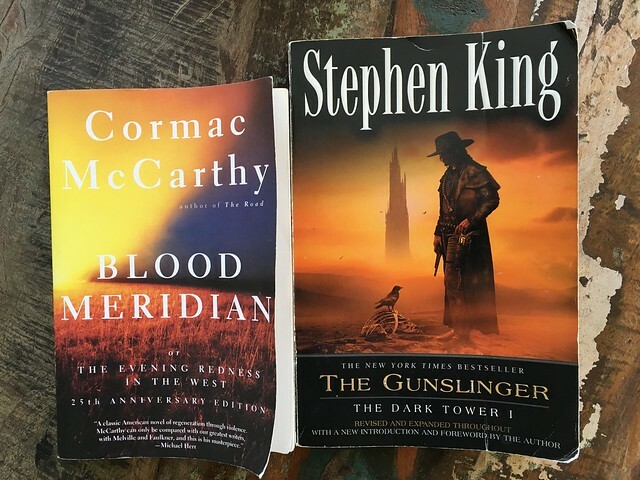 The Gunslinger by Stephen King was a title I bought at the local thrift store for 25 cents, and packed it to read while I was in Puerto Rico for a month. I read the entire (then) King shelf as a teen and 20 something, and it is fast reading. It held my interest for the idea of a future set western story, but was hardly surprising. Co-blogged with the next title. 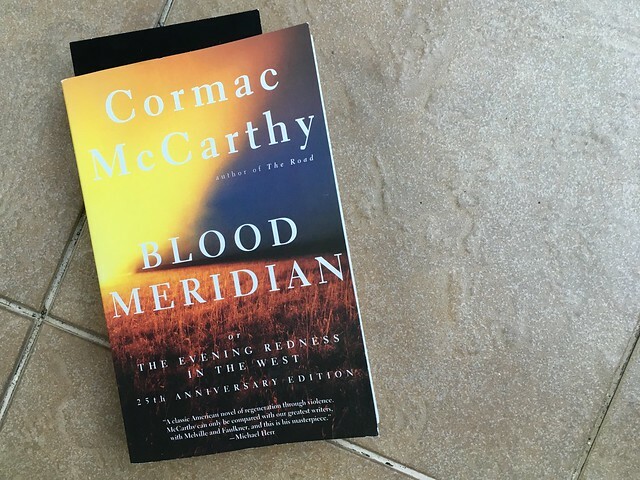 Blood Meridian: Or the Evening Redness in the West by Cormac McCarthy has been described by Jim Groom to me as both one of the best novels and most brutal. This is no heroic western cowboy adventure, it’s all the ruthlessness of human behavior played out violently over a landscape that care not about humans. It was a bloody read too. And a re-read. And I am still pondering it. Dark, bloody, dark. Do not read this book lightly. Coyotes by Ted Conover was a title I pulled from a new Little Free Libary that opened here in Strawberry (which in turn has led to a hiking friendshp with Eric who put it up). 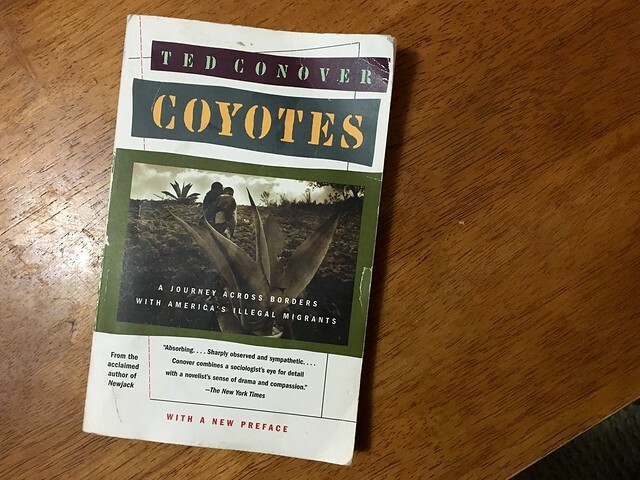 Conover brings us to the reality of illegal immigrants through his time of working with Mexicans on both sides of the border. This brings a whole human element to the issue much deeper than we get in the news. 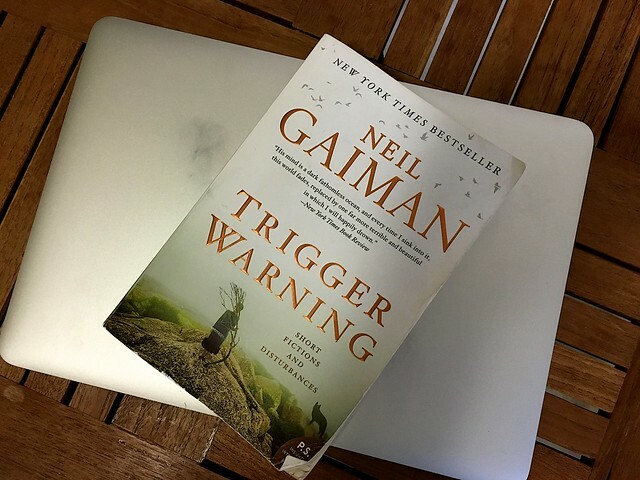 Trigger Warning: Short Fictions and Disturbances is the collection of short stories by Neil Gaiman. As such it has a variety of ones that got my heart going and other “meh” page turners. The one about the writer and the imagined girlfriend was a favorite; the return story to American Gods was a bit flat. A good variety though, it was a good read/ ride through many ages and places. 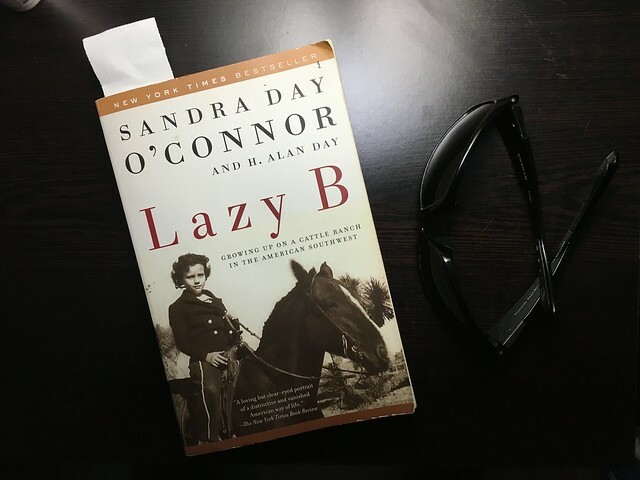 Lazy B by Sandra Day O’Connor Alan Day was another reading I did while thinking of western ds106. It’s the family story of Sandra Day O’Connor’s family that settled a not so hospitable chunk of land in southeastern Arizona, and unfolds the real life of cowboys and girls (more bloggage). That’s 15 I found, and I think there might be more, but I am tired. I left out two children’s books and a dog training book or 12. Westerns were a theme because I was hoping to teach that western flavored ds106. And without any real objective, I am noting four are centered on strong women. Four are science fictions, and I can credit Bryan Alexander for reading or linking to four of the titles I read. But I read more than I thought; I know I read four books the month of February while I was in Puerto Rico (no TV and limited internet in my apartment). Hah, and I have 12 posts written about books I read this year. Not too shabby. Heck, I might not even need to make a goal for next year. But 2 books a month sounds doable. Maybe I will be back next year with pointless charts and data. More books read, less pounds on the scale in 2017? I knew that Felix would be a good influence on you! A nifty selection of good reads, too. If I had more panels in the comic, the visit from you and Peter would be there. Thanks so much for making the trip (and I have to read your roadtrip Geology book, where did I put that?). A number of colleagues, some of whom I have gone to visited, have come to Phoenix recently for conferences and don’t even think to reach out to let me know. So your visit to my home is special. Hmm, I’ll have to go post about my book reading sometime/somewhere and make charts like Martin’s post referenced above. I’m on a roll, so far at 87 for 2016 with only 2 of them re-reads. A whole lot of them are my cozy mysteries though, they are like book candy, I can whip through them really fast. Isn’t _Blood Meridian_ the stuff? Oh, I wished I’d taught it in class. Looking back, what did you make of _Jump Off Creek_? PS: what should the book club read next? I wished I was a student in your class teaching Blood Meridian. Maybe it’s time for some near post apocalyptic reading? There was alot I liked about Jump Off Creek- a lot that the characters were close to, but on closer inspection, quite less predictable than typical westerns. I liked learning more about the Oregon frontier, for some reason I don’t always think of it as west as the dry southwest, but it definitely was, right up to current social attitudes. A lot of rodeo tradition there. If I remember the author was fan of and/or had written some sci fi too. It was a real treat that someone in our circle knew the author. Maybe we can find a book where the author might engage too? I’m always up for post apocalypse. and certainly with a living, engaging author. Thank you for the Jump Off Creek reflection. Maybe another Bacigalupi book? I can see if my friends who know him might be able to set something up. Maybe Wind-Up Girl. Which is excellent.